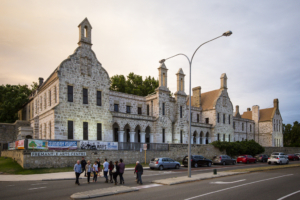 Free parking is available outside Fremantle Arts Centre on Finnerty Street, Ord Street and Vale Street. Paid parking is available at Fremantle Leisure Centre (opposite FAC on Ord Street). Two disabled parking bays are located on Finnerty Street, next to FAC’s entrance. Additional parking is available at John Curtin College Oval, adjacent to FAC on Vale Street. Fremantle train station is 1.2km from FAC. You can walk from the station to the Arts Centre in approximately 15 mins. Alternatively, you can catch the FREE Fremantle Red CAT Bus from the station. There is a stop located outside FAC on Ord Street. The bus leaves every 15 minutes from Fremantle station. Visit the Transperth website for the latest timetable. There is a large bike rack at the front entrance to FAC, located on Finnerty Street. FAC is a heritage listed building with access limitations. If you have any special requirements please contact reception on 9432 9555. Disabled toilets are available. If you require access to our upper levels please contact FAC Reception on 9432 9555 in advance. All of FAC’s Art Courses (except the Ceramics Studio) and the Pavlich Room are located on the first floor. Dogs are not permitted in FAC’s grounds, guide, hearing and assistance dogs excepted. Non-commercial photographs are welcome in FAC’s grounds and inside the building. Please note FAC’s grounds are open to the public daily and are not available for photography bookings. Applications to use the grounds for feature films, TV or commercial photography are considered on a case-by-case basis. Please contact Andrea Woods, Marketing & Communications Manager on 9432 9564 to make a request.